Brian Laudrup is the best player I've seen play for Rangers. He was fantastic (I will use this word as studies have shown it's his most used English word – if it's good enough for him it's good enough for me) both in a footballing sense and for natural attractiveness. Grown men talk about Laudrup in a language normally reserved for the Lounge on Follow Follow. Some real weirdos (me) even have Twitter accounts named after parts of his body and 800-plus pictures of the man on their phone. The first time I saw Brian Laudrup was against Motherwell at Ibrox in the first game of the season as we raised our sixth league title in a row. We were pretty poor in the first half and Motherwell took the lead. However just before half time this majestic man put a fantastic cross in for Hateley to do what Hateley did. 1-1, however far better was to come. Five minutes to go he got the ball from a corner we were defending and started to move up the pitch. He managed to glide past the whole team almost and slot through to Duncan Ferguson (Note that we kept a player up front in those days) and things only got better from there. Fantastic. Laudrup's best feature, at least in a footballing sense, was moving past players as if they weren't there. He never looked like the hardest worker but on the ball over 10 yards he was the fastest I've ever seen. Watch his fantastic acceleration against Celtic at Hampden in the 1994 Scottish Cup semi-final. His burst through to lob Marshall was fantastic. This was also the first game I remember the full Rangers end saying "We're not worthy" and there is a great video of him going to take a corner in front of the whole Rangers end bowing down. I've never seen it since and doubt we will ever see it again. 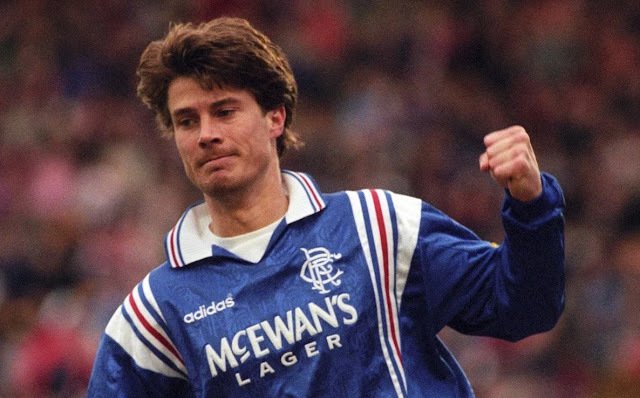 There are two matches in Laudrup's Rangers fantastic career for which he will forever be remembered: His header at Tannadice to win the ninth title will go down in history as one of the top moments in Rangers history so I won't embellish on it here. The other is the Scottish Cup Final in 1996 – the only Cup Final where a man who scored a hat trick didn't pick up man of the match. Laudrup looked especially fantastic in this game. And he played great football too. He scored the opener, put three on a plate for Durie and also managed to nutmeg a keeper from pretty much the corner flag. That's how good he was. Also he hadn't finished there as when the bus arrived back at Ibrox he was on the roof smoking a cigar with Gazza. He is also on record as saying he can't even remember being up there. So not only is he fantastically good looking and amazing at football but he would also be good company for a night out. As you may have been able to tell I am struggling to put into words just how fantastic Brian Laudrup was for Rangers. People may argue he was only here for the years but the impact he had was unbelievable. Older guys from RSCs I've been involved with do put him up there as the best they have ever seen. He made going to see the Rangers exciting and with him in the team we always thought something fantastic was likely to happen. Will we ever see his likes again? I doubt it but you never know. I am thankful that in my lifetime we saw such a brilliant talent as Brian Laudrup at Ibrox. If you are under the age of 20 watch the YouTube clips, buy the DVD and talk to anyone about how good he was and you will not be disappointed. For a time he was ours, and he was, in a word, fantastic.